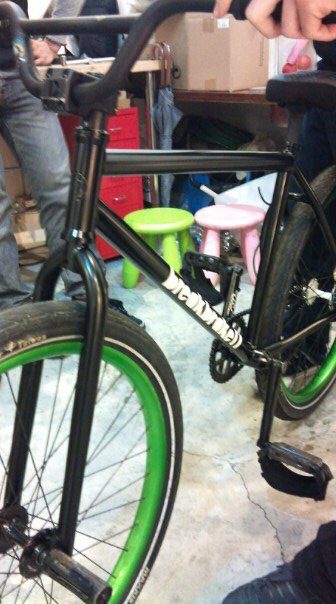 Breakbrake17 26" frame sneak peak! I checked my email this morning and was super excited to see that CogWei had tagged me in a photo! I quickly checked and it was what I had expected it to be. The prototypes have arrived in Breakbrake17, the riders should be receiving theirs very soon, including mine! I'll be sure to take lots of photos so remember to check back! Sorry, Swoo, but are the 26" specific fgfs frames any different than a 26" bmx frame? Yeah in this case they are. The bottom bracket is raised up enough to give double peg ability but not so much that it makes it awkward to ride around. We tried to keep as minimal as possible so we don't add even more to the loss of leg extension we get from lowering the top tube a bit. And the top tube height is another factor, it's slightly lower, but again, not so much that it's retarded like the Volume Vandal (which is basically a 26" bmx frame, literally..) However....... I have no idea how it'll feel to be honest haha. Can't wait to put it together and test it out! Looks sick, I wanna try it when you get it! I definitely agree that the Vandal is "too far" but Volume is fully aware and the next one will be more reasonable. Purely FWIW, my Vandal feels way less stupid now that my ratio is better and I have lighter wheels.